Credits: Clockwise, from left to right: Skirt Photo via Marina di Amrem Pinterest, Paper Flowers by Sabrina Transiskus via Upon a Fold, Cupcakes by Canelle et Vanille, Bride photo by Kate Benson Photography, Glitter photo by Shelby Fenlon via Bicyclette, Invitation by Andrew Townsend, Bride shoes photo by Carla Ten Eyck Photography via Style Me Pretty, Place Setting by Melissa Hayes via Style Me Pretty. 1. Drip Tease Teacup and Saucer from Reiko Kaneko, $48.13; 2. 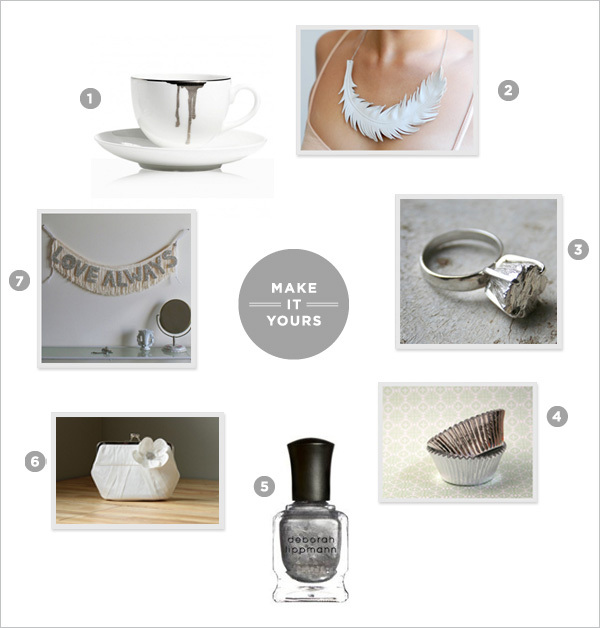 Ivory White Feather Necklace from Love at First Blush, $40.00; 3. Rockwell iii Ring from Macha Jewelry, $355.00; 4. Silver Foil Cupcake Liners from Sweet Estelle’s, $3.25; 5. Deborah Lippman Marquee Moon Nail Polish, $16.00; 6. Silk Pleated Clutch from Babbs Boutique, $73.50; 7. Love Always Banner from nice, $38.00. So beautiful! 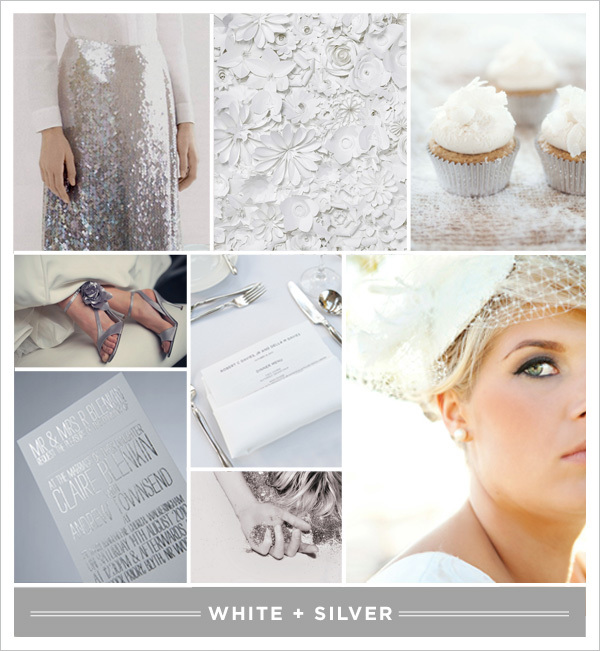 One’ of my brides is doing white and silver this year and I can not wait for her wedding. Such a great combination! 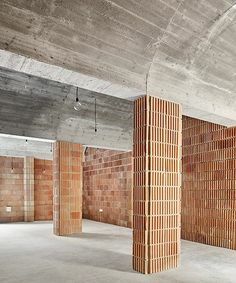 Very unexpected and yet sophisticated. Love it! Gorgeous, I love this combination and so many of the others you’ve presented. Definitely inspired! Can I request White + Orange next?? @Erika: Sure! I hadn’t decided on next week’s palette yet, so White + Orange it is. Thank you for thinking of my Love Always banner! I love seeing it with all of these pretty things.. I especially love that sequin skirt and the floral paper cuts!